What variety of turf is suitable for my lawn? Summerhill Lawns use grass seed mixtures to create a versatile and popular turf. It has a fine appearance combined with a high wear tolerance which makes it the most frequently specified garden and landscaping turf in Ireland. What time of year can I put down a new lawn? ‘Roll-out’ lawns can be used all year round. In the height of Summer it will need extra water during the first 10 days to survive. In winter time your preparation might be more difficult due to in climatic weather, but overcoming these is possible and laying the turf can continue. Why should I turf my lawn rather than seed it? The principal benefits of using turf rather than seed to produce a new lawn is the greater speed and certainty of even establishment and complete coverage. A newly-turfed lawn is normally ready for use in a matter of weeks, whereas it can be months before one is able to safely walk on a newly-seeded lawn, let alone use it for the rough and tumble of everyday outdoor activities. Even then, competition from birds, small mammals, weeds and the weather means that a seeded lawn will require close attention over the coming months. There is no guarantee that all the seed will germinate, so it can be a year, often longer, before your entire lawn looks like a lawn and can be used as a lawn. In the case of turf, it is the professional turf grower who takes the uncertainty and risk out of the complete operation from ground preparation to sowing, fertilising to spraying, watering to rolling and mowing to vacuuming. The turf supplied by Summerhill Lawns will have taken from 12 to 18 months to bring to maturity. During that time, it will have been carefully tended and given everything it needs to make it suitable for lifting and laying in its new home. It is said that seeding costs less than turfing. That may be true if one compares solely on the cost of the seed for one square metre of soil with the cost of covering that same square with turf. However, having taken into account the care and attention needed to bring a seeded lawn to the same level of growth, density and maturity as a turfed lawn then the ultimate difference in cost is marginal. Choosing turf from a reputable, professional grower such as Summerhill Lawns removes the problems of seeding. With turf, what you see is what you get. The same cannot be said for seed. How do I measure what I need? Measure the area of your planned lawn. Multiply the average length by the average width to determine the amount of turf you will need. Sketching a plan of your area may assist you. If you are measuring an irregularly shaped area you may find it easier to break the area up into smaller shapes to assist your calculations. We recommend you add 5% to the final area to cover wastage / trimming to fit edges. Alternatively, click here for more details. How big are your rolls of turf? The turf comes in 1 square yard rolls (0.836 of a sq metre) which are 1350mm (54”) long by 610mm (24”) wide with a depth of 12.5 – 19 mm. These come in 20 square metre rolls which are 74 cm wide by 27 metres long. Newly laid turf must be watered within half an hour of installation. Give the turf a really good soaking and check that the water has seeped through the turf and into the soil below (turn up a corner to check that this has happened). This watering must be repeated until the turf has established. Weather conditions will dictate the frequency of watering required. Ensure that your new lawn has enough moisture to survive hot, dry and windy weather. If laid during hot periods, watering should be repeated at least three times each day, otherwise twice daily should be sufficient. Can I use my lawn straight away? provided you are not sinking into the turf as this will cause bumps. wait longer before using it for athletic activities. Make sure your lawn is firm and has rooted fully. When should I mow my new lawn and how often? Mow your new lawn as soon as it needs it, aim to keep the height of cut at about 25mm. Keep your mower in good condition with a sharp blade to ensure a clean cut. Can you deliver to my location? Yes, we provide a nationwide delivery service throughout Ireland with at least 2 days’ notice. What days do you deliver to my area and what time can we expect our delivery at? We deliver Monday-Friday with at least two days’ notice. Depending on your location Monday deliveries might not be possible. We will do our best to accommodate requests to deliver at a certain time, but it is not always possible to do so. All daily deliveries are made between 8am and 5pm. How will my new lawn be delivered ? Summerhill Lawns operate a delivery service throughout Ireland. All orders are delivered within 48 hours of order (in most cases) or your day of choice. Our transport vehicles are fitted with mounty off loading forklifts which allows turf to be placed where you need it. Some small deliveries are made via jeep and trailer. If we get a contractor to deliver your new lawn, it will be unloaded on pallets by a lorry with a tail lift and pallet truck to offload onto a smooth, solid, level surface which is usually on the kerb or in the driveway. How long can I leave my new lawn rolled up? Turf is a perishable product so it is best to have all your preparations done before the lawnturf arrives so that you can lay it as soon as possible. During Spring, Autumn and Summer when it is mild or warm you will need to lay your new roll-out lawn within 48 hours. When the weather is cooler in winter, the lawnturf doesn’t heat up as quick so you will gain an extra day before it needs to be rolled out. Can I lay my new roll-out grass on my existing lawn? It is recommended to roll out your new lawn on ground that has been specifically prepared for turfing / seeding. Please click here to go to our step by step guide to follow our guidelines. If your soil has not been properly prepared it might lead to future problems such as compaction, no water soakage, old weeds coming back through the new lawn, the old lawn will rot and the new roots might get difficult to penetrate through. Do I need to order extra to allow for wastage and cutting at the edges? We do recommend that you order at least 5% extra for wastage. If the area to be turfed is square, wastage will be minimal but odd shapes will have more wastage due to a lot of cutting at the edges. It is important to spend extra time getting your measurements correct so that you can get your lawn finished on schedule. Gaps are appearing in my new roll out grass, what should I do? If gaps are appearing in your new lawn it is because it is drying out. When a roll of grass starts to dry out it shrinks which creates the gap. If the lawn is well watered and kept moist the gaps will not appear. Water your new lawn immediately. What is the smallest amount of turf I can order? For people collecting lawnturf there is no minimum. The minimum for delivery orders are 10 sq meters or 12 sq yards and we will need to be in your area to deliver this small amount to you. Yes, VAT is included in the price. Mushrooms / fungi / toadstools have recently appeared on my new lawn. What should I do? Toadstools occur naturally in most fertile soils and start to grow when the soil is disturbed because of harvesting your new lawn. Toadstools on your new lawn are completely harmless. Brushing or mowing the toadstools will destroy the fruiting bodies. If the weather is damp and mild it will favour the fungi to germinate. Once all the spores have germinated, toadstools will not not re-appear on your lawn. While toadstools might appear for a time after you laying your new lawn, it is a sign of a healthy, organic soil. Will I need to feed my New Lawn? Please click here to find out more information of our aftercare guidelines. Do Summerhill Lawns Ltd provide a secure website? 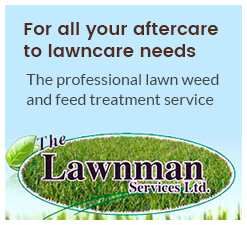 Why should I purchase my new lawn from Summerhill Lawns Ltd? Summerhill Lawns is grown from only the very best seed on Ireland’s most fertile soil. We choose only top rated seed mixtures based on colour, texture, density and disease resistance to ensure a quality turf is produced. Because we sell turf that we grow, you can be certain that the very highest standards are maintained from seedbed preparation and sowing right through to harvesting and delivery of mature turf.